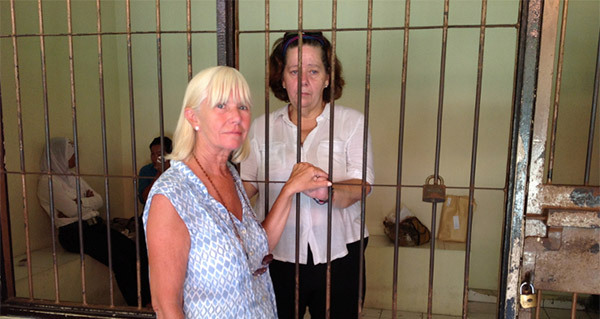 8 April, 2013 Help 56 year-old British grandmother Lindsay Sandiford appeal her death sentence with the Supreme Court in Bali. The UK government won’t help her but we can. 23 April, 2013 The legal fees for this appeal have now been raised. However, there may be subsequent challenges to her death sentence which will require further funding. Please keep an eye on this page for future developments in Lindsay's case. Lindsay was found with 4.8kg (10.6lb) of cocaine at Bali airport. She was sentenced to death by firing squad. As it was read out, there were gasps of surprise in Denpasar District Court as not even the prosecution had been seeking the death penalty. In her witness statement, Sandiford said: ‘I would like to begin by apologising to the Republic of Indonesia and the Indonesian people for my involvement. I got word from her sister, Hilary, this Monday (April 8th) that Lindsay lost her first appeal. Now, Lindsay has until April 24th to file an appeal with the Supreme Court to fight for her life. She will then have two more weeks to submit her appeal. She needs legal help to this. However, she doesn’t have the funds to pay a lawyer and the UK government will not help her. Lindsay needs £8,000 to file the appeal with the Supreme Court. The UK government has refused to help her get a lawyer and mount a defense. But we can help. We’ve already raised over £3,000 — with your help we can raise the rest. Getting Lindsay the £8,000 will at least give her a chance to fight for her life. We did it once, we can do it again! Before her first appeal, I set up an IndieGoGo campaign and we raised several thousand pounds in just a day. We had to refund those funds since another campaign raised the required money independently. So I know we can do because we did it once. And we can do it again. This time, I am coordinating with Reprieve so that we don’t have a duplication of efforts. Time is of the essence, so please help out as soon as you can and please tell your friends and spread this as far and wide as you can. Ideally, we need to raise this amount in just a few days so we can get Lindsay the funds as soon as possible. I’ve spoken with Reprieve and they will be forwarding the money raised to Lindsay to file her appeal at the Supreme Court. I don’t know Lindsay personally, I hate drugs, and I don’t condone what Lindsay did. But I also don’t believe that she deserves to die for it. So, on behalf of someone whom I’ve never even met, please help so that we can give her the chance to fight for her life. Because everyone deserves the right to a legal defence.